“In a land of enchantment, a garden most gorgeous, a plain sprinkled with coloured meteors, a forest with sparks of purple and ruby and golden fire gemming the foliage.” With laudanum-washed eyes, heroine Lucy Snowe swallows the incandescence of an inaudible nocturne in a moonlit park, as she withdraws from the garish streetscape of a night festival in Charlotte BrontÃ«’s Villette. Relieved of their embraced modalities, her senses surge with BrontÃ«’s literary swell, interchanging with sister receptors of sight, taste, and sound. The impassioned writings of BrontÃ« merge with those of numerous other women in Sisters of the Extreme, a diverse amalgam of literary trips into the oft overlooked and misunderstood female drug experience. Ranging from recognized personas of modern culture to the distant figures of antiquity, Sisters shares the insights of Elizabeth Barrett Browning, Louisa May Alcott, Billie Holiday, AnaÃ¯s Nin, Maria Sabina, Maya Angelou, and Carrie Fisher among others, exploring wondrous psychoactive journeys taken and occasionally, the treachery of footings lost. Originally published in 1982 under an alternate title, the editors present new text, fresh illustrations, and a comprehensive bibliography that rounds out this enhanced second edition. 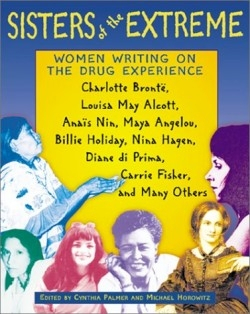 By virtue of its diverse blend of voices and experiences from women of all professions including a writer, an anthropologist, an actress, a nutritionist, a prostitute, and a physician, Sisters draws a wide audience beneath its mushroomed canopy of brilliant histories and literary excerpts. The book covers nearly all conceivable avenues to neural distortion, including opiates, laudanum, morphine, heroin; stimulants such as amphetamines and cocaine; the psychedelic reach of LSD, peyote, and psilocybin, as well as the relatively pedestrian stroll with hashish and laughing gas.